Doris Renninger-Brell, a beautiful wife, mother, grandmother, great grandmother and pilot, was a dedicated aviation leader and aviatrix in the New York/New Jersey metropolitan area. She was extremely active in business, civic and national aerospace activities. Doris was a fixed wing pilot for 50 years and in 1963, became the first woman in New York State to receive an FAA rotorcraft-helicopter pilot's license. Doris was the daughter of Henry and Margaret Harvel of Roanoke, Virginia and was the wife of W. Henry Renninger, Air Transport Command pilot and one of the original five founders of Seaboard & Western Airlines. Henry Renninger was Vice President of Engineering and Director of Materials for Seaboard. Doris began flying in Fort Myers, Florida and her first lesson was on January 10, 1955. She soloed five hours later in an Aeronca Champion and in May, 1955, received her pilot's license. Doris joined the Ninety Nines (International Organization of Women Licensed Pilots) in 1957. She has held all offices in the New York/New Jersey Section and on an International level, Treasurer and Executive Board Member. Doris served as General Chairman of the 40th Anniversary Convention of the Ninety Nines, which honored the memory of Amelia Earhart, the organization's first President. This convention was held at the Waldorf Astoria in New York City in 1969. She was appointed Chairman of the International Membership Committee and was also Vice Chairman of the International Woman's Air and Space Museum of the Ninety Nines. Her aviation-related activities were multitudinous. She flew a broad range of fixed wing single and multi-engine aircraft, as well as various types of helicopters and even the Goodyear blimp, Mayflower II. In 1963, at Hurst, Tex., she started her rotary-wing training and soloed a Bell helicopter in seven hours as an aviation industry demonstration during the Aviation and Space Writer's Convention. She flew No. 2 Lear Jet in Wichita and was the first woman to fly the 600 mph Lockheed Jet Star in 1961 at Palmdale, followed by flying Lockheed's HL 286 rigid rotor helicopter at Burbank, Calif. In 1966, she was appointed Director of Commercial Helicopter promotion of Hel-Aire Copters, Ltd. with offices located at the Midtown Heliport, New York City which is operated by The Port Authority of New York and New Jersey. Doris flew the first Brantly 305 (5 place) helicopter to be operated in the New York Metropolitan area from Frederick, Oklahoma to New York City, a 1,500 mile flight. She is the 59th member of the Whirly Girls, worldwide organization of women licensed helicopter pilots. Doris served as Co-Chairman of the "Colt for Kim" project' where she assisted in obtaining three million S&H Green Stamps for the purchase of a "Piper Colt" airplane for Captain Kyung O. Kim of the Korean Air Force. This plane was presented to Captain Kim to teach other women in Korea to fly. She was awarded the coveted Lady Grace Hay Drummond Hay Trophy by the Women's International Association of Aeronautics in 1963 for her outstanding achievements in aviation; also the coveted Amelia Earhart Medal by the Ninety Nines, Inc.; the "Winged Victory Trophy" by Bell Helicopter Company, Women's Winged Victory Achievement Trophy at the Annual International Order of Characters Aerospace Symposium. In February 1974, the FAA presented their "Certificate of Appreciation" for her dynamic leadership and personal contributions to the entire aviation industry. In 1974 she was presented the Bishop Wright Air Industry Award at Kennedy Airport in New York for her "… outstanding leadership in promoting the role of women in aviation, and her continuing devotion and service to the air industry and its peoples." The opportunity to experience the freedom of flight made Doris aware of the freedoms she enjoyed and always supported the men and women in the military. She was aware, too, of the opportunities being made available to the next generation of women in aviation and loved to bring that message to groups in public schools, colleges and other organizations. A board member of the College of Aeronautics at LaGuardia Airport, she promoted aviation education and programs to help the less fortunate attend the college. She was a member of a number of aviation organizations, such as: the American Helicopter Society, Aircraft Owners and Pilots Association, National Aeronautic Association, the elite International Order of Characters, Whirly Girls, Ninety Nines and the Wings Club of New York. She was a member of the Women's Advisory Committee on Aviation for the FAA and was President of the Women's International Association of Aeronautics. After Henry's medical retirement from active airline management with Seaboard, Doris found the perfect job for an outgoing aviation enthusiast-manager of the Wings Club at the Biltmore Hotel in New York City. The Wings Club is an aviation membership club that provides fellowship, fraternity, and business networking in a gentile setting. With a membership of the Who's Who of aviation, Doris worked with presidents of airlines, leaders of aerospace industries, heads of governmental organizations, and military leaders. One week an award luncheon for General Jimmy Doolittle, another week a salute to Neil Armstrong, a Valentine's luncheon with Madame Anna Chennault, a spirited luncheon address by Frederick Smith of FedEx, names from aviation history and the future, all touched by the skilled club management of Doris. Her tenure as manager was best known for her "never-quit" battles when the Biltmore was sold and demolition began before the club could transition to new quarters. She kept interest in the club alive when many would have allowed it to close, and Doris was there to cut the ribbon on the new club facility in 1982. The passing of Henry Renninger in March 1980 was later honored when Doris christened a Flying Tigers Boeing 747-200F the "W. Henry Renninger".This aircraft has flown in the colors of Flying Tigers and Fed Ex. As of 2006, the aircraft was flying in an unmarked white paint scheme for El Al -- a fitting tribute to Seaboard & Western aircraft and crews that flew unmarked and unheralded in many early flights. Time and friendship brings changes and in 1982, time brought Doris back in contact with Carl Brell, a long-time family friend and also a founder of Seaboard. Wedding bells rang out on November 27, 1982, as Doris and Carl began a new life together. Both later retired, Doris from the Wings Club and Carl from Zicon, a company he ran for many years. They left Long Island and lived in Hampstead, N.C. for 10 years before moving to Southern Pines, N.C. Both avid golfers, they spent many wonderful days enjoying the sport and each other. Doris fell during an exercise class and died from the fall on January 20, 2005. Doris and Henry had two children, Charlene and Warren ("Rennie"). Charlene is married to Clifford T. Nilsen and have two children, Wendy and Kurt. Charlene and Cliff live in Pinehurst, N.C. Rennie married Karen Anderson and spent 26 years in the Air Force, retiring as Colonel to work in the insurance field living in Punta Gorda, Fla. Tey have a son, Dean. There are five great grandchildren. Carl Brell is living near his son David near Providence, R.I. and his daughter, Mary Jane, is in Seattle, Wash. David has a daughter, Amy. Doris is truly missed by family and friends around the world. Her glass was always at least half-full no matter what troubles she faced. Her smile and energy were known by many, from great grandkids to astronauts. Doris always loved aviation and always had wings There is no doubt that at the dawn of every heavenly day, with a twinkle in her eye, she is exclaiming to her Lord, "I'm sooo hoppy." 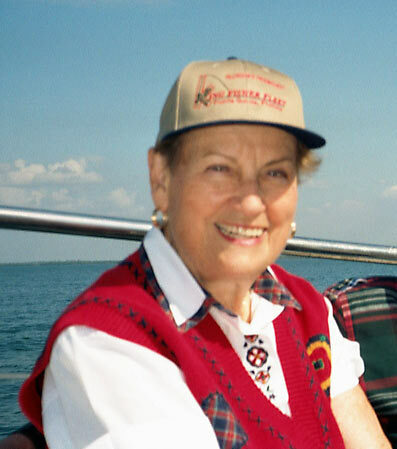 Doris is seen here at the 2001 SPAR reunion in Punta Gorda, Fla.